Add Your View – if you have any comments or questions on FXCM, feel free to add them here. FXCM won’t act as a bookmaker on forex spread betting, so there is no conflict of interest. Every time you spread bet, FXCM will open a trade in the underlying market to hedge your bet on a one-to-one basis. For example, if you buy the EUR/USD market then FXCM will take the corresponding long position in the same forex pair. Note that because all spread bets are hedged in real-time in the relevant underlying markets the ‘spreads’ available with FXCM can vary. The FXCM spread betting platform is a result of more than 10 years of constant development and improvement to the FXCM trading platforms. FXCM offers one-click execution as standard on all products. For cost transparency they display all charges in the same price window as the dealing price. This means that you know exactly how much you will pay or receive on rolling trades when you keep a spread bet open overnight. With FXCM spread bets are ‘rolled’ each day. Therefore as long as you have the funds in your account any trades that you don’t close are automatically rolled over to the next trading day. There is either an overnight financing charge or credit to your account, depending upon whether you are buying or selling a market. FXCM offers clients a range of charting packages (note that charges may apply for certain charting packages). At the heart of FXCM’s offering is its No Dealing Desk forex trading. In short, clients benefit from FXCM’s large network of forex liquidity providers (banks, financial institutions, prime brokers and other market makers) which enables FXCM to offer competitive spreads on major currency pairs. FXCM’s No Dealing Desk forex execution aims to provide clients with fair and transparent execution. Every new trade is executed back-to-back through one of multiple banks or financial institutions. These liquidity providers compete to provide FXCM with buy and sell prices. The result is that the best spreads available to FXCM are offered to clients. There is a small markup by FXCM but this is normally just one pip for major forex pairs. 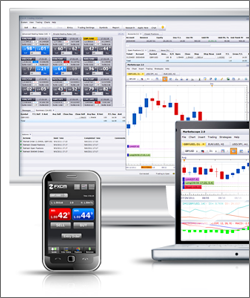 Also see Demo Accounts for Spread Betting and CFD Trading. 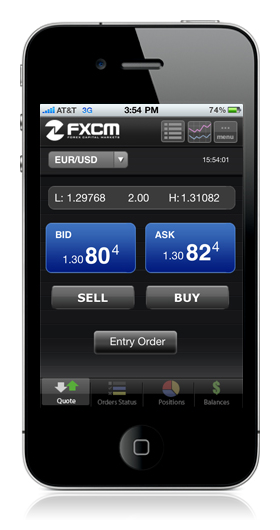 According to the 2013 Investment Trends report, FXCM is the largest forex provider in the United States†. Forex Capital Markets, Limited is authorised and regulated in the UK by the Financial Conduct Authority, registration number 217689. FXCM Inc., a publicly traded company listed on the New York Stock Exchange (NYSE: FXCM), is a holding company and its sole asset is a controlling equity interest in FXCM Holdings, LLC. Forex Capital Markets Limited (“FXCM LTD”) is an indirect operating subsidiary of FXCM Holdings, LLC. † based on the 2013 Investment Trends US Forex Report with ratings from 11,456 investors. This apparently makes the Investment Trends report the largest study of online retail investors in the United States.